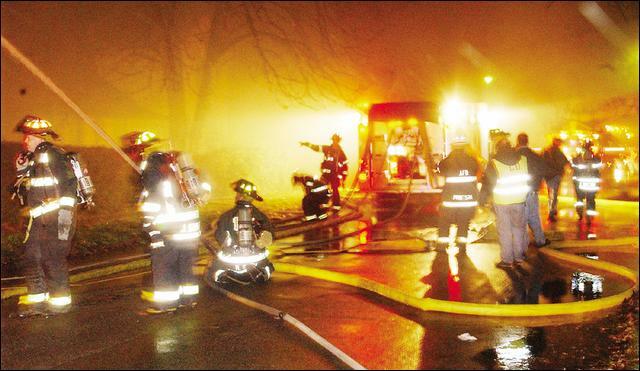 ASHTABULA � Four area fire departments battled heavy winds while fighting two raging fires late Saturday evening on West 37th Street as a small crowd gathered at the West Avenue intersection to watch. Firefighters arrived on the scene around 11:10 p.m. to find two separate fires, said Ashtabula Fire Capt. Gerald Senger. �A lot of flames,� was how Senger described the massive blazes that were burning on opposite sides of the street, about 100 yard a apart. �They called immediately for backup,� Senger said. Crews were called from Geneva, Saybrook Township and Ashtabula Township. Two homes, side by side at 1032 and 1100 W. 37th St., were burning on the south side of the street, several hundred yards east of West Avenue. At the same time, the house at 1117 W. 37th St. was also burning on the north side of the street. Closer to Lake Avenue. An initial search of the buildings found there were no people inside. Both fires are suspicious in nature and are under investigation by the Ashtabula Fire Department�s Fire Prevention Bureau, Senger said. Senger said it is rare to be fighting multiple structure blazes but it does happen from time to time. �Usually its when they are close together,� he said because proximity of homes generally causes fire to jump from one building to another. Senger said both fires were clearly deliberately set. The fire at 1117 W. 37th St. was fought with a master stream of water coming from a large house in front of the house and numerous handlines manned by firefighters at various places around the building. Across the street, an aerial platform was used to put out the fires at houses at 1100 and 1032 West 37th St.
A fire department report indicates 27 firefighters, from the four departments, were on the scene for as long as three hours. About 120,000 gallons of water were used to bring the three fires under control, the report states. It also states that the homes at 1117 and 1100 West 37th Street were total loses and the structure at 1034 W. 37th St. had moderate smoke and fire damage. West Avenue was blocked for several hours as fire hydrants near West Avenue and West 38th Street were used to provide water to fight the fires. Ashtabula police officers blocked traffic during the blaze.